Mix mutton,smallonion and green chillies chopped, gingergarlic paste,salt and water altogether and cook it in a pressure cooker. when the pressure is fully gone open the lid and if still the water resists, allow to cook with open lid until the water dry up. 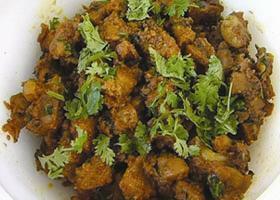 Heat oil in a pan and in simmer fire add black pepper and in it add the mutton and mix together. When it is cooked well and oil is visible then add coriander leaves and mix it. Thereafter add the fried onions in it.